...very efficient, helpful, and gave me a good quote. Whether you’re in the market for a new commercial or industrial HVAC system or your existing system needs to be repaired or maintained immediately, we’re here for you. We offer a number of different options for our customers, and we can customize yours so that your customers keep coming back and your employees remain productive. Contact our friendly experts today to discuss your needs. Advantage Air Conditioning of the Treasure Coast, Inc provides commercial and industrial HVAC services in Fort Pierce, FL and the surrounding areas. Are you in the market for a new commercial or industrial HVAC system? Having trouble deciding what to choose? We can assist you. We specialize in all aspects of commercial and industrial HVAC installation, and we spare no effort at making sure that your new investment functions just as it should, and that it also lasts reliably for the years ahead. Let us take care of the details. Over time, every commercial or industrial HVAC system suffers from wear and tear. This is simply an inevitable consequence of running your system 24/7 throughout the year. There may come a time when repairs are no longer possible, and you need to upgrade your system. We can help. Our commercial and industrial HVAC replacement service is excellent, so don’t hesitate to give us a call today. Having trouble with your rooftop AC? Do you suspect that your commercial heater is not working just as it should? Is your dehumidifier busted? Whatever your commercial and industrial HVAC repair needs may be, you can count on our team for just about everything. We specialize in handling such issues swiftly and comprehensively, and we’ll have you back up and running in no time at all. 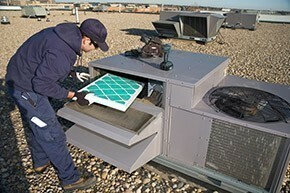 In order to get the most from your commercial or industrial HVAC system, you need to take care of it. The best way to do so is by hiring our professional technicians for routine maintenance. We can thoroughly inspect, clean and tune–up your system on a regular or periodic basis, depending upon your needs. It’s the best way to stay ahead of problems. Let’s face it. If it’s winter and it’s too cold in your shop or restaurant, your customers will not be pleased and your employees will not be productive. We offer excellent commercial heating services throughout the Fort Pierce area, including installation, replacement, repair and maintenance. During the summer heat and humidity, keeping your entire commercial space sufficiently cool can certainly be a challenge. We can make sure that you have what you need with our excellent commercial air conditioning services. We offer a number of different systems for installation and we specialize in repairs. Sometimes, it’s not enough to think only of temperature. For truly outstanding comfort, you need to consider the air quality of your indoor space. With our commercial indoor air quality products and services, you can make sure that your business never suffers as a result of customer discomfort. Call us today to learn more about our many commercial HVAC services.